This 990 mile luxury train journey is a perfect illustration of South Africa as a world in one country. Travel the grasslands of the gold-rich Highveld and trundle through the spectacular mountain ranges and scenic wine lands of the cape. All in 5 star luxury. Your train “The Pride of Africa” departs Rovos Rail’s Station in Capital Park at 3:00PM. 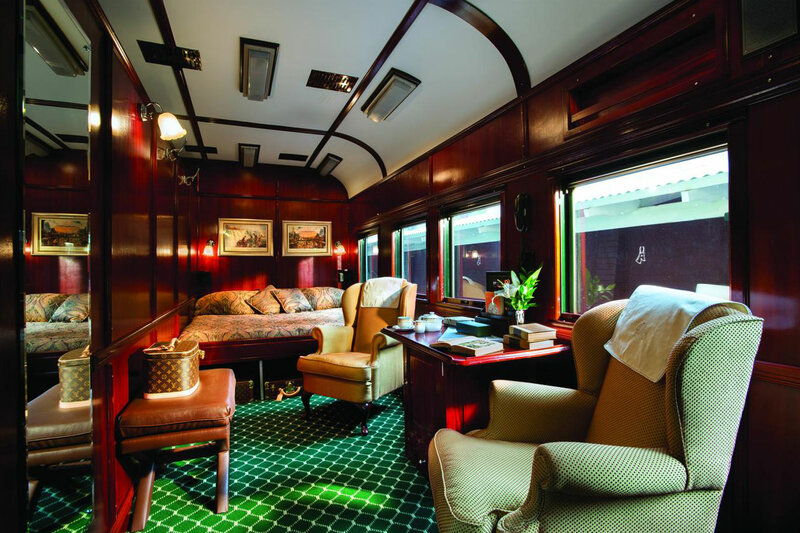 Guests may freshen up in their suites before joining fellow travelers in the midway Lounge car or Observation carriage at the rear of the train. 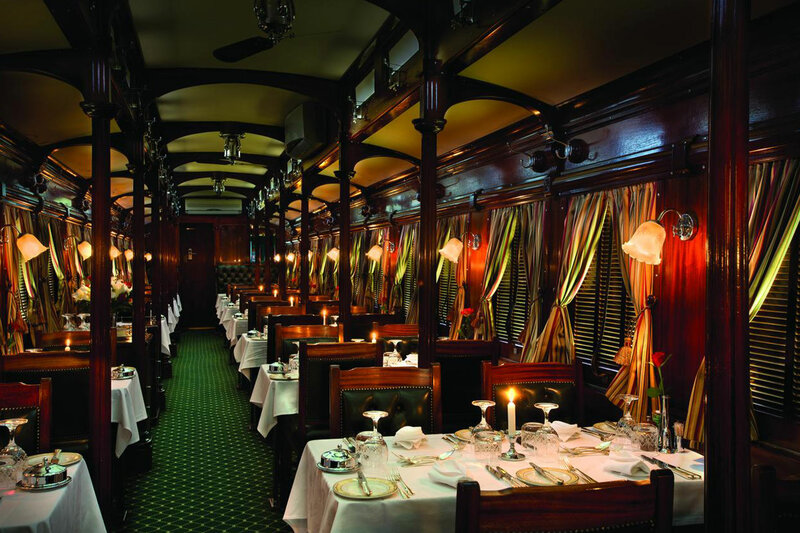 Meals are served in the Victorian atmosphere dining car. Breakfast & lunch are smart casual and dinner is a dress-up affair. Enjoy a gourmet dinner with a fine selection of South African wines. Dinner is served at 7:30PM in one seating. Breakfast is served in the dining car between 7:00am and 9:45am. Enjoy breakfast while the train travels to Kimberely. Ten minutes before arriving in Kimberley keep your eyes out for a shallow lake on the right hand side facing forward. On most occasions there are spectacular flocks of Flamingos (approx. 23 000). Arrive in Kimberley at 9:45am where you will disembark and board a coach /combi for a tour of the city, the Mine Museum and the world’s largest man-made excavation, the “Big Hole”. Kimberley has considerable historical significance due to its diamond mining past and siege during the Second Boer War. Notable personalities such as Cecil Rhodes made their fortune here and the roots of the De Beers Corporation can also be traced to the early days of the mining town. Re-board the train and depart Kimberley at 12:30pm. Freshen up for lunch which is served in the dining car at 1:00PM as the train winds it way towards the Northern Cape. 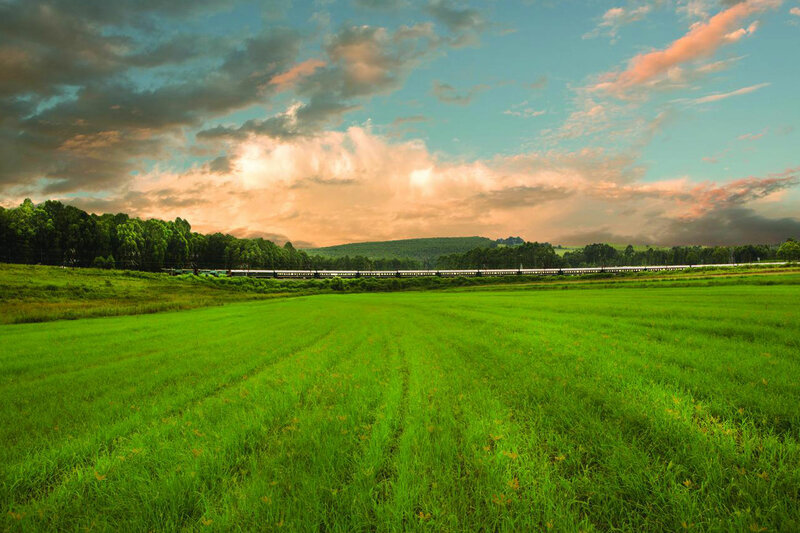 You have the afternoon free to enjoy the scenery and relax until dinner at 7:30pm in the dining car. The train will arrive at 8:00am into Whitehill, next to Matjiesfontein, an authentic perfectly preserved Victorian Village. There is an extended breakfast this morning for those who would like to disembark and walk the 3 miles into Town. You will have a chance to stroll through this historic settlement. Of special interest is the museum on the platform and a collection of historic cars and railway carriages to the right of the Hotel. A Train Manager or a member of staff will accompany you. Comfortable walking or running shoes are essential. Return to the train and enjoy breakfast until 10:am. Afterwards the train departs Matjiesfontein passing through Tweedside and Touws River. At noon you reach the first of four tunnels which take you through the Hex River Pass. The second tunnel is over 8 miles long. Make your way to the dining car for lunch at 1:00PM and enjoy lunch as the train passes through the Hex River Valley and the town of Worcester. From Worcester to Cape Town, the train winds it way though the scenic Cape Winelands to Cape Town. The train arrives at Platform 24, Cape Town Station at 6:00pm where your journey ends. Pullman Suite – 76 sq feet. Equipped with a comfortable sofa-seat during the day with a conversion to double or twin beds for the evening, along with an en-suite bathroom with shower. Deluxe Suite – 118 sq feet. They accommodate two passengers in either twin or double beds, plus a lounge area and en-suite bathroom with shower. Royal Suite – 172 sq feet. The Royal Suites take up half a carriage and are spacious and elegant. Each has its own private lounge area and full bathroom with a Victorian bath and separate shower.